The Morar catchment is situated in the West Highlands, due west of Fort William. 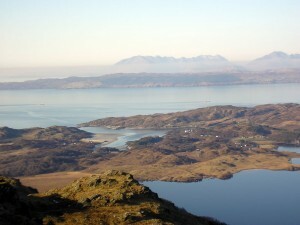 It is dominated by Loch Morar which lies east/west and is 18.8km long. The loch is the deepest body of freshwater in Britain at over 310m and is reputedly home to Morag, Nessies cousin. The loch enters the sea via the River Morar, one of the shortest salmon rivers in Scotland, 600m. The river has been harnessed for hydro electric power generation since 1948. Loch Morar is a Site of Special Scientific Interest (SSSI). The loch fishing has been covered by a Protection Order since 1992 providing for the regulation of angling through the issuing of permits whilst assuring public access at a reasonable cost. There is a thriving local angling club and the loch is used by many other angling clubs for outings and competitions.